A chemist searches for new knowledge about chemicals and uses it to improve the way we live. He or she may develop products such as synthetic fibers, drugs, and cosmetics. Chemists create processes, including oil refining and petrochemical processing, that reduce energy use and pollution. They specialize in areas such as analytical, organic, inorganic, physical and theoretical, macromolecular, medical, and materials chemistry. Chemists often work as part of a research team,so they must possess the ability to work with others toward a common outcome. Chemists often have a specialty, such as a forensic chemist, organic chemist, physical chemist or medicinal chemist. A chemist's salary varies based on the level of education, experience, geographical location, and other factors. A chemist job requires at least a four-year college degree, although there are benefits to pursuing higher levels of education. College degree: If you want to be a chemist, you will need to earn at least, a bachelor's degree in chemistry. However, most research jobs require a master's degree or, more likely, a Ph.D.
Internships: While not mandatory, an internship, work-study program or fellowship can help students gain experience while completing their degree, to help make them better job candidates. Experience: With experience and advanced education in the form of a doctorate, chemists can become lead researchers. Additional experience can mean assignments that include working on bigger and more complex projects. Problem Solving and Critical Thinking Skills: Your work as a chemist will identify problems and come up with possible solutions to them. Before implementing those fixes, you will have to evaluate each one and then predict which one will be the most effective. Speaking, Listening, and Interpersonal Skills: Since your job is likely to involve working on a team, the ability to communicate with others is essential. Time Management Skills: Excellent time management skills will allow you to meet deadlines. Organizational Skills: Strong organizational skills will be needed to keep track of your data, and carefully document all processes and results. 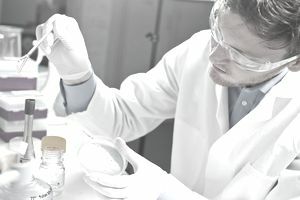 According to the U.S. Bureau of Labor Statistics, the growth outlook for chemists and materials scientists over the next decade relative to other occupations and industries is the same as the average for all occupations, driven by a continuing need for chemists to work on developing medical nanotechnology. Employment for chemists is expected to grow by about 6 percent over the next ten years, which is slightly slower than the average growth projected for all occupations between 2016 and 2026. Growth for material scientists is projected to be 7 percent over the next ten years, while physical scientist jobs are projected to see a 10 percent increase over the next decade. These growth rates compare to the projected 7 percent growth for all occupations. Lab experience outside of a classroom, such as with an internship, can help improve job prospects for new chemistry graduates. Advanced degrees and work experience, especially with green chemistry, can increase your prospects, and jobs will continue to be available due to the need to replace chemists leaving the occupation. They primarily have jobs in research and development in the physical, engineering, and life sciences. Pharmaceutical manufacturers and testing laboratories also employ chemists. Some work for the federal government, as well as state and local governments. Their workplaces are labs and offices, where they are often part of research teams. Chemists usually work regular, full-time hours. They may occasionally need to work longer hours to meet project deadlines, or perform time-sensitive work after hours. Look for chemist jobs using online job-search sites such as Indeed.com, Monster.com, or Glassdoor.com. You can also visit online sites that specialize in science-related jobs, such as NewScientist.com. Locate an internship to help you gain exposure, through your college's career center. You can also check for available internships on the same online job portals that post regular job openings. Additionally, try visiting the American Chemical Society's (ACS) website for undergraduate internship opportunities. Join the American Chemical Society and sign up for events to network with others in your chosen field. The ACS site also has a career center with job postings.